Meyer Werft advised today that there will be a further delay in delivering AIDAnova due to continued testing necessary on the LNG propulsion system. Delivery has already been delayed once resulting in the cancellation of the series of four preview cruises that were to run from November 15 to December 2. This delay is causing the cancellation of the inaugural cruise on December 2 which was to position the ship from Hamburg to Tenerife for the winter season. The complete story appeared in the November 16 edition of Cruise News Daily. Remember when the phone company used to say, “It's the next best thing to being there?” Last night Royal Caribbean officially named Symphony of the Seas in Miami, and we have some video for you. We think this is better than being there because not only don't you have to get dressed up to “attend,” you don't have to search for a parking place or deal with Miami traffic, but you have a better view than if you were there sitting in the middle of that throng. All that's missing is a glass of champagne, but if you run to the refrigerator and have a little imagination, that can of Mountain Dew can taste just as exquisite and has just as many bubbles. The video below will show you highlights from the naming ceremony and some comments by Royal Caribbean executives and the godfamily who named the ship. The second video will take you abaord. Beginning next fall, Windstar's Star-class ships are going be getting longer and more fuel-efficient, thanks to a $250 million Star Plus Initiative. A contract was signed with Fincantieri to do the work, and these days, Fincantieri seems to be THE place to go these days to get your ship stretched. The complete story appeared in the November 15 issue of Cruise News Daily. Rendering courtesy of Windstar Cruises. All rights reserved. May not be copied or used without express permission. 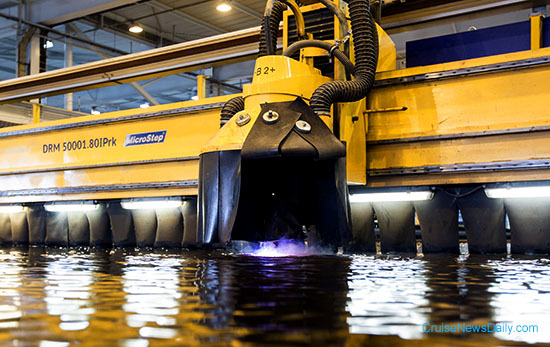 Meyer Turku began construction of Carnival Cruise Line's new 180,00-ton XL-class of ships with the cutting of the first steel today. The ships will be Carnival's first powered by Liquified Natural Gas (LNG), and the first in North America to use the clean-burning fuel. At the same time, Carnival revealed the ship's new hull design and the new Carnival livery which will debut on the as-yet-unnamed ship in 2020. Details appeared in the November 15 edition of Cruise News Daily. A 70-year-old woman died in an incident which began when she fell off a tender platform aboard Maasdam in the South Pacific last week. The incident happened on day 10 of a 14-day French Polynesia cruise from Papeete, which would have been last Wednesday (November 7) at 1:30pm, when the ship was at while in Avatiu, Rarotonga, in the Cook Islands. Details appeared in the November 14 issue of Cruise News Daily. A 52-year-old woman went over a railing of Royal Princess on the Lido Deck (Deck 16) and fell onto a lifeboat (the tops of which would be about at Deck 8) in the early hours of Tuesday morning. The complete story appeared in the November 14 edition of Cruise News Daily. 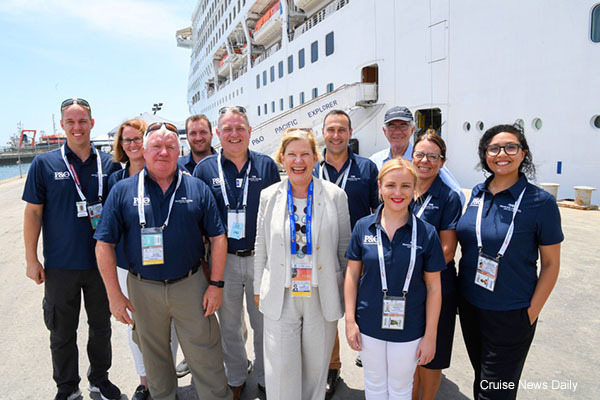 Carnival Australia Chairman Ann Sherry got a three-fer when she went to Port Moresby (Papua New Guinea) Thursday for the APEC (Asia-Pacific Economic Cooperation) meetings. The government has chartered three Carnival Australia ships to serve as housing for attendees. As we reported earlier, the ships are P&O Cruises' Pacific Explorer and Pacific Jewel and Princess Cruises' Sea Princess. Ms Sherry said supporting APEC with the three chartered Carnival Australia ships was "a natural extension" of the company's relationship with PNG communities. In 2016-18, its ships were scheduled to make 250 port calls bringing 400,000 cruise visitors to PNG destinations. She was greeted by members of the Mk Kuri Kala group who gave her a demonstration of their music and treated her to a face painting. 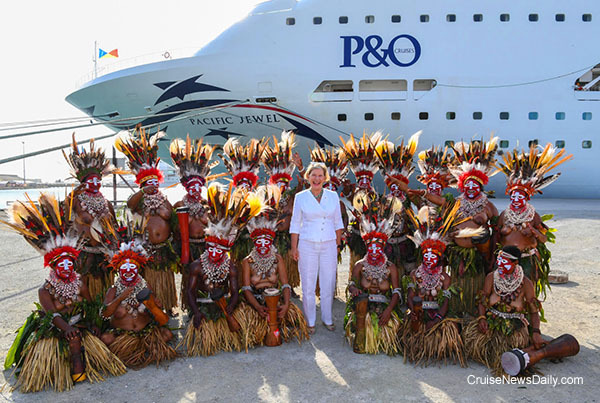 "This is exactly the sort of rich cultural experience our guests enjoy when they visit PNG on cruise visits to otherwise hard to reach locations," said Ms Sherry. "It was a real privilege to meet this cultural group from Western Islands Province." This story appeared in the November 14 edition of Cruise News Daily. Photos courtesy of Carnival Australia. All rights reserved. May not be copied or used without permission. Carnival released 2020 itineraries for Carnival Radiance and Carnival Sunshine today, showing they will both have diverse programs, but both will be sailing from New York in the summer months, and both will feature occasional sailings to Cuba, the line's first from New York. In addition, there will be an expanded program to Bermuda. There will also be itineraries to the Caribbean, Canada and several cruises from Norfolk. The complete story appeared in the November 13 edition of Cruise News Daily. Just in time for the holiday - or the winter cruise season - Princess Cruises has announced that Princess gift cards will be available in more than 3500 brick-and-mortar stores including Kroger, Harris Teeter and Giant Eagle locations nationwide. Details appeared in the November 13 issue of Cruise News Daily. Club Orange may sound like an exclusive juice bar, but it's actually a new extra-service program for passengers aboard Holland America Line. It's part of the suite services for those purchasing the top suites, but what's unique is that it's also available to a limited number of other passengers on the ship who are willing to pay for it no matter what type of accommodations they book. The benefits include priority services, private dining and extra menu selections. The complete story appeared in the November 12 edition of Cruise News Daily. About a month ago we told you about Carnival's plans to convert Carnival Victory into Carnival Radiance in 2020. Now we learn there's a late addition to the Lido Deck - a seagoing branch of Shaquille O'Neal's Big Chicken fast food restaurant. O'Neal opened the first branch of his Big Chicken on Paradise Road in Las Vegas last month. It serves his own brand of fried chicken sandwiches and sides, from recipes he helped develop himself. Details appeared in the November 12 issue of Cruise News Daily. Photo courtesy of Carnival Cruise Line. All rights reserved.